So there’s a new annual vaccine on the market – Lepto 4 – but the regulator is unable to say whether it’s safe or not? However, the European Medicines Agency Veterinary Pharmacovigilance Report 2014, didn’t have the same problem. So whilst the European MCA was able to separate the Lepto vaccine from other vaccines but the UK VMD was not, the EU nevertheless thinks that there is enough of a problem to give this vaccine a special mention in its report. And although they say that dogs have been known to have massive and life-threatening allergic reactions to the vaccine (anaphylaxis), and autoimmune diseases, they’re pretty cool about it and don’t see any need to act just yet. This means that every dog who receives the Lepto 4 vaccine is part of a medical experiment involving a vaccine under scrutiny, and use of this vaccine may affect the dog’s wellbeing and even end his life. 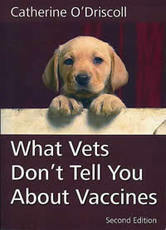 A massive 79% of canine vaccine reactions were put down to the fact that warnings and/or contraindications were ignored. I suspect this means that the licensing requirement, “do not vaccinate sick animals” was ignored, since most vets ignore it as a matter of course. Meanwhile, how many dogs are suffering from inflammatory and autoimmune conditions as a result of the Lepto 4 vaccine? I have heard many reports involving epilepsy, behavioural changes, heart failure, inflammation of the liver, spleen and heart, loss of eyesight, collapse and death. The regulators are onto it – but are the dog owners who have a duty to protect their innocent dogs? Is it safer to vaccinate than risk leptospirosis? In May 2014, Christopher Ball from the University of Liverpool presented a thesis about leptospirosis in dogs. He thanked “MSD Animal Health for funding the project, without which none of this work would be possible”. Obviously it made good business sense for MSD/Intervet to fund this study, since it might support use of their new Lepto 4 vaccine. • Due to the perceived low rates of infection in the UK, the canine leptospirosis vaccine is also not currently considered a ‘core’ vaccine in the UK (unlike the vaccines for parvovirus, para-influenza virus, canine distemper and infectious hepatitis). • In the UK, the human vaccine is not routinely administered due to the low incidence of cases (between 50-60 a year) (HPA, 2012). • Climate plays a role in Leptospira infection rates, with temperate climates not having extreme weather situations that may contribute to infection rates. According to the Köppen climate classification, the UK has a rating of Cfb, meaning cooler summers but also milder winters. The classification reflects the milder climate changes between seasons which reduce the likelihood of leptospirosis. So why are vets and the veterinary vaccine industry trying to say that leptospirosis is so much of a problem in the UK that all dogs should have the vaccine? Mr Ball sent out a questionnaire to vet practices in the UK for his thesis. Of the 472 questionnaires he sent out, only 89 were returned. Of these, by far the largest response came from vet practices which had seen no lepto cases in the previous twelve months. Only 13 practices reported a case within the last twelve months, of which only five had lepto confirmed by a laboratory test. A further 29 practices reported having seen a case within the last 15 years. No practice in the study reported seeing two or more suspected (or confirmed) cases in the 12 previous months. Yet very similar (possibly identical) figures were given by MSD on its website for the ‘CICADA’ survey, which is being used to justify annual vaccination against leptospirosis. Yet, to me, these figures highlight a product desperately looking for a market, and not a validation for Lepto 4. The European Medicines Control Agency has asked MSD to evaluate whether there are more adverse reactions to their new Lepto 4 vaccine than the older two-way vaccine. I had a look at the datasheets to see if there was anything that might shed some light on the issue. Sodium chloride (salt): The term ‘hypernatremia’ means higher than normal concentrations of sodium in blood. Signs of excess salt in the blood include increased thirst, confusion and disorientation, coma, seizures, vomiting, and diarrhoea. MSD thinks it’s a good idea to inject salt into our dogs: salt that we avoid in their foods. Potassium chloride – used to cause cardiac arrest within the “three drug cocktail” used for executions by lethal injection. Side effects (from uses not intended to kill) can include gastrointestinal discomfort, including nausea and vomiting, diarrhoea, and bleeding of the digestive tract. Too much potassium in the blood is called hyperkalaemia (causing muscle fatigue, weakness, paralysis, abnormal heart rhythms, nausea). Disodium phosphate dehydrate (DPD) – used within saline laxatives and enemas. According to Toxnet, part of the American government’s National Institute of Health, “Saline laxatives are tolerated reasonably well by most patients. However, they need to be used with caution or avoided in patients with renal insufficiency, cardiac disease, or pre-existing electrolyte abnormalities and in patients on diuretic therapy. Potassium dihydrogen phosphate (PDP): According to medsafe.govt.nz’s PDP factsheet, PDP injections should be administered with caution in people who already have high phosphate levels, such as those with hypoparathyroidism, chronic renal diseases, rhabdomyolysis [where skeletal muscle is broken down; can lead to kidney failure], and heart disease (particularly in patients taking digitalis). PDP injection is contraindicated for those with severe renal function impairment, Addison’s, and low calcium levels, and there’s a wide range of drugs which contraindicate its use, including NSAIDs, ACE inhibitors, calcium containing medicines, diuretics, and digitalis containing medicines. They also list ADVERSE EFFECTS associated with PDP injection, including very low or irregular blood pressure, heart attack, high blood potassium, tiredness, weakness, slow heart rate, anxiety, trouble breathing, convulsions, muscle cramps, and acute renal failure. I wonder if vets take all of these contraindications and adverse effects into account when they go along with the ‘need’ to vaccinate dogs against lepto – a RARE disease in the UK? Interestingly, the Nobivac Lepto 2 datasheet only lists Thiomersal under its ‘pharmaceutical particulars’. So you have to ask whether the added minerals might have something to do with the apparently high rate of seizures, deaths, and other adverse reactions which appear to be related to the Lepto 4 vaccine. Unless, of course, they just didn’t bother to list the additives on the Lepto 2 datasheet? The problem is, unless information is provided by manufacturers, and required (and shared) by regulators, we are all left guessing. Asking them is unlikely to produce results. There’s also the question: “does this vaccine prevent disease?”. Well – the jury is sort of out. MSD claims they’ve got the four main serovars (types of lepto) covered, but the list of serovars is growing due to the improving technical ability to actually identify them. Currently there are known to be around 300 serovars. Not all are infectious, but not all of the infectious ones are in MSD’s vaccine. Apart from that, our thesis author says it’s not been possible to identify which are actually causing disease in the UK.